(BOSTON) — Science and celebrity coexisted on Monday night as members from Harvard’s Wyss Institute for Biologically Inspired Engineering mingled with stars of the silver and LCD screen, from Salonge to Steve Buscemi to Van Jones, at the 2017 Webby Awards hosted by Cipriani Wall Street. 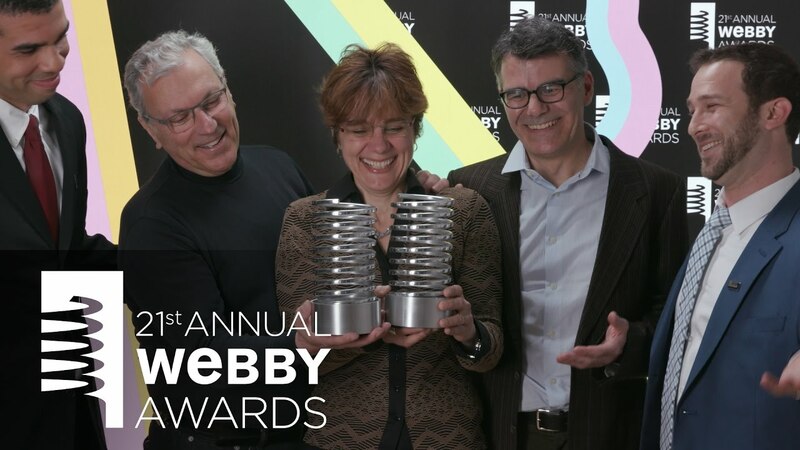 Founded during the Internet’s infancy in 1996, the annual Webby Awards honor excellence in six major online media types, including Websites, Film & Video, Advertising, Media & PR, Social, Mobile Sites & Apps and Podcasts & Digital Audio. This year’s contest received 13,000 entries from nearly all 50 states and 70 countries worldwide. The Wyss Institute was awarded the top prize for its redesigned Website and Mobile Site in the School/University category, beating competitors from near (MIT Media Lab, Harvard Graduate School of Design) and far (Stanford University, Manchester Fashion Institute). The Wyss was also named an Honoree for its podcast episode, ‘Disruptive: Rapid, Low-Cost Detection of Zika & Future Pandemics’ in the Science & Education category for Podcasts & Digital Audio. In addition to being considered the Internet’s highest honor, the Webby Awards are famous for their strictly enforced 5-word acceptance speeches. The Wyss’ speech, which can be seen in the video below, was delivered by Operations Director Mary Tolikas, Administrative Director Ayis Antoniou, and Communications Team members Seth Kroll, Benjamin Boettner, and Max Rousseau. The rest of the Communications Team – with the notable exception of website project mastermind Lucy Thomas and multimedia producer Lei Jin – also attended the awards: Mariel Schoen, Jacqueline Murphy, Jacob Watts, Eriona Hysolli, and Lindsay Brownell. Among the group’s favorite moments were enjoying rooftop views of New York City at the welcome reception, meeting the Global Marketing Lead of Niantic (creators of Pokémon GO), and dancing to DJ Questlove at the Highline Ballroom during the afterparty.